You can read the feature on my new product collection on the Print and Pattern blog. Stay tuned for some Christmas specials with these products coming soon! I recently designed a Christmas card for the annual Greyhound Rescue Christmas Card Fundraiser. They come in a pack of 8, with 7 other artists work and proceeds go to help rescue and re-home greyhounds. I don’t own a greyhound, but I do own an adorable whippet and I’m so glad to help out in this small way. I’m sure most of you can relate... I’ve been overwhelmed and not very productive despite many, many hours of working on my business (a recent career change and international move have not helped with this!). I finally sat down and brain dumped all my to-dos and then worked out what I really needed/wanted to do, not just for my business, but also for my life in general based on my values, and found it super helpful to do it this way. By focusing on my values, it quickly weeds out the stuff that simply isn’t worth my time and helps me to focus on the stuff that is, and to make better decisions. Anyway, being a designer, I wanted to make something I would actually use and want to look at regularly (and make it all pretty) so I made a mini ebook! It has really helped me and I just wanted to share it with others who might find it helpful too because we all need to support our fellow Bs! I’ve called it The Clarity Objective. In a nutshell, it is a simple value-based plan to work out what you want in life and move forward with completing the tasks and goals that feed back to your values. By doing this, you can achieve more organisation, balance and focus and use your time wisely. It’s only 12 pages as you want to get to the point and not add another thing to your to-do list! I was recently featured on the Skillshare blog. 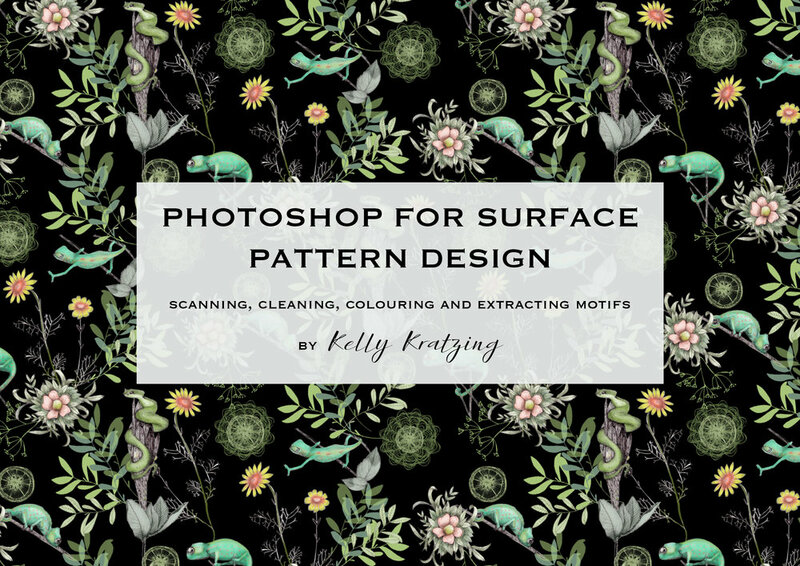 Please check out my Photoshop for Surface Pattern Designers courses if you are keen to learn more! Debut of my home office collection! I'm excited to debut the first products in my new home office collection which consists of a chameleon fabric pouch, wildflower fabric pouch and juniper and lime essential oil wax melts to help you create the perfect workspace! I have a limited edition of the pouches available, so if you like one please visit my online shop asap at http://www.kellykratzing.com/shop as I won't be making more of this style once these are gone. Thanks for supporting my business! 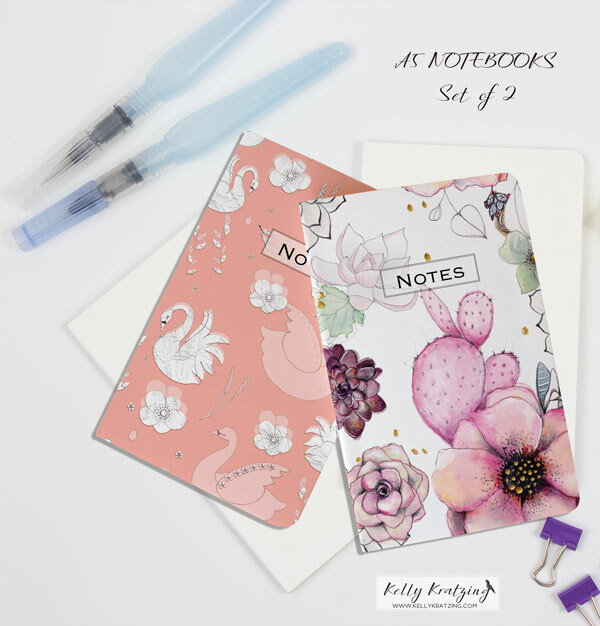 COMING SOON...MY OWN STATIONERY COLLECTION! I'm very excited to share that I will soon be providing stationery kits for wholesale opportunities! Here is a sneak peak of what I will be offering! I will have A4 deskpad weekly planners, A5 notebooks and large canvas pouches all designed with my exclusive chameleon pattern. If you are interested in stocking these items in your shop, please contact me at kelly.kratzing@icloud.com for more information. I also have prints and original artworks that will soon be released for sale. Stay tuned! I just published my very first Skillshare class on Photoshop for Surface Pattern Design: Scanning, Cleaning, Colouring and Extracting Motifs! 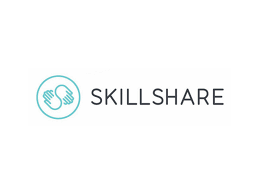 Skillshare has lots of amazing short courses for $99 per annum. Highly recommend! Proud to be featured on the Make it in Design Blog! I had the great pleasure of designing the wallpaper and packaging for a new dumplings store in the Melbourne CBD which just opened! I am looking forward to working with the team again to update their wallpaper and packaging every 6 months! I have just received my sample fabric pouches and I'm really happy with how they turned out! They will be sold as stationery kits (along with coordinating washi tape and A6 notebooks) at markets and it my Etsy shop shortly. I recently participated in the Hartwell Christmas Twilight Market which was a great success. Items are still available in my Etsy store and would make great gifts for Christmas. New cards and notebooks in my Etsy store just in time for Christmas! They would make great Christmas gifts or stocking fillers so get in quick before they go! Their print quality is amazing and I highly recommend them. This is also currently the only place where you can get some of my best designs printed on fabric. 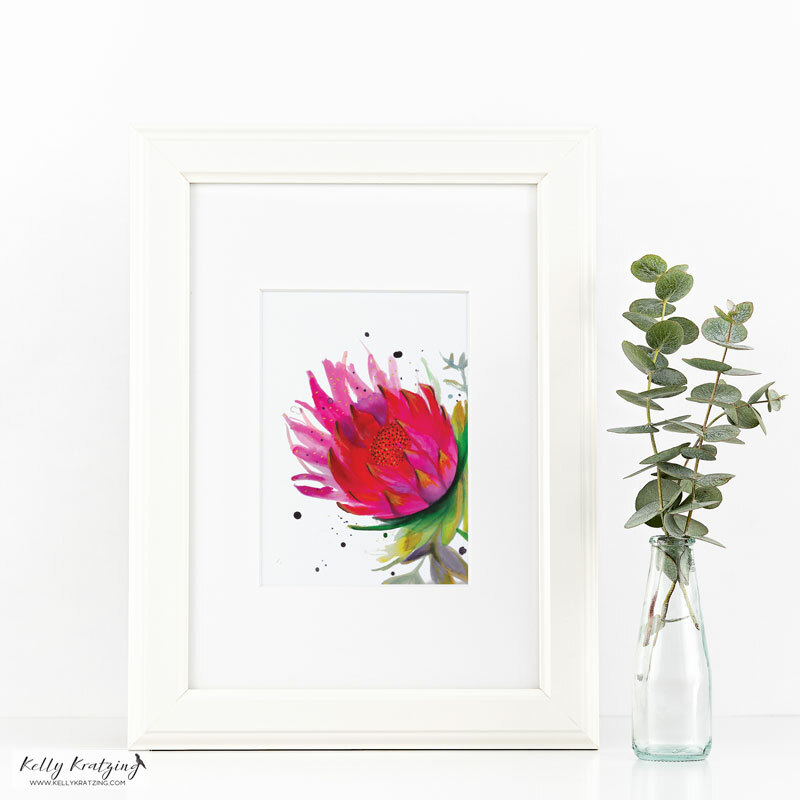 I've just completed my first assignment for Folio Focus - Bold Florals! I used a combination of watercolour and prismacolour pencils. Christmas Card packs available in my Etsy shop! I have just added a set of 6 Christmas cards to my Etsy store www.etsy.com/shop/kellykratzing. 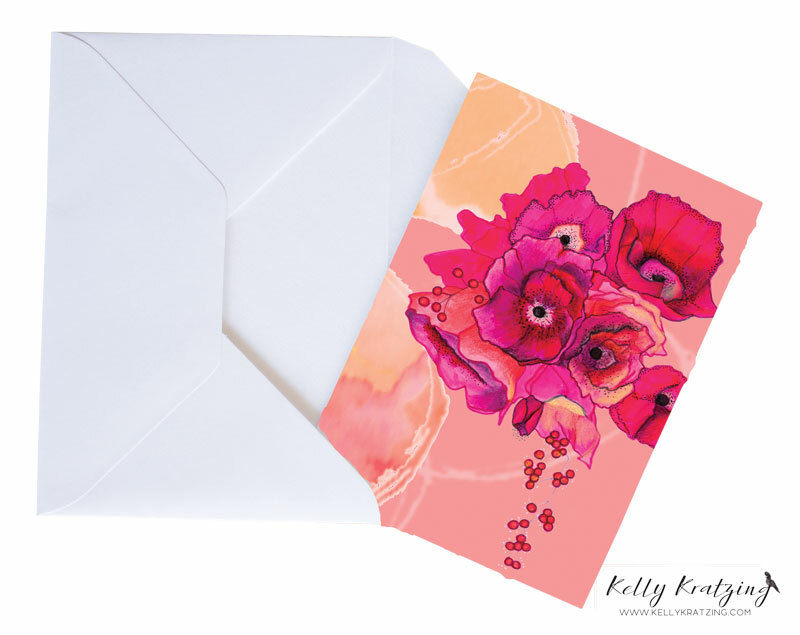 There are 6 unique illustrations with matching envelopes. It's never too early to buy Christmas cards! MY DESIGNS AVAILABLE ON FABRIC WITH NEXT STATE PRINT! Next State Print have just launched their Fabric Creator feature at www.nextstateprint.com! 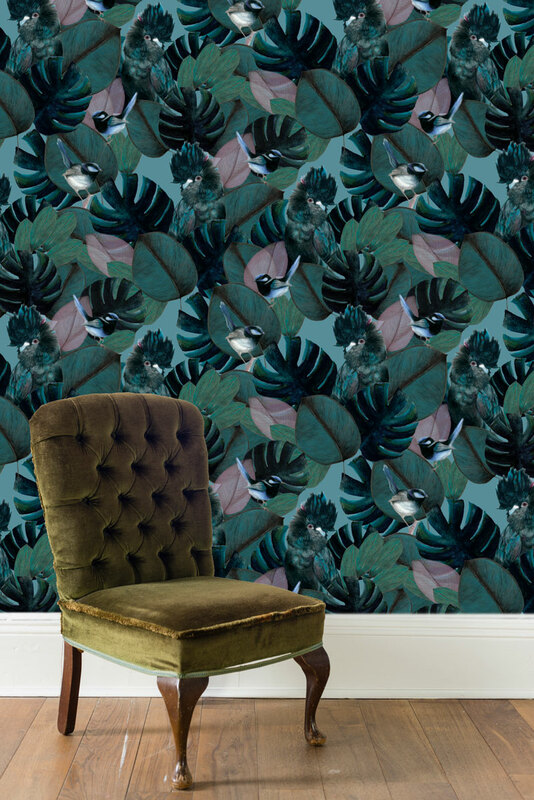 I am excited that a selection of my designs are featured in their artwork library, so if you like any of my designs, you can now have them printed onto your fabric of choice (Next State Print have quite a large range, including organic) and have it printed and delivered to your door! 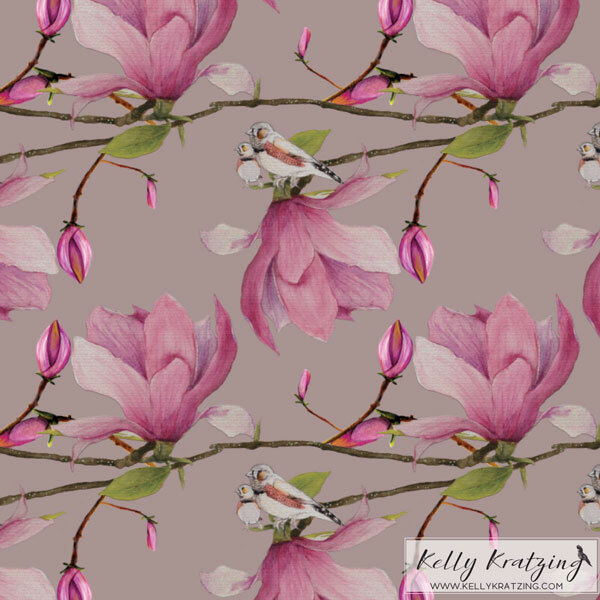 I would love to see what you make with them so tag #kellykratzingdesigner! New artwork in my Etsy shop! You can now order my designs on a variety of fabric through Next State Print! Go to www.nextstateprint.com - Fabric Creator - Select From Library and you can search for my designs. There is a variety of fabric you can choose from and only 1m minimums per order. Their quality is second-to-none! 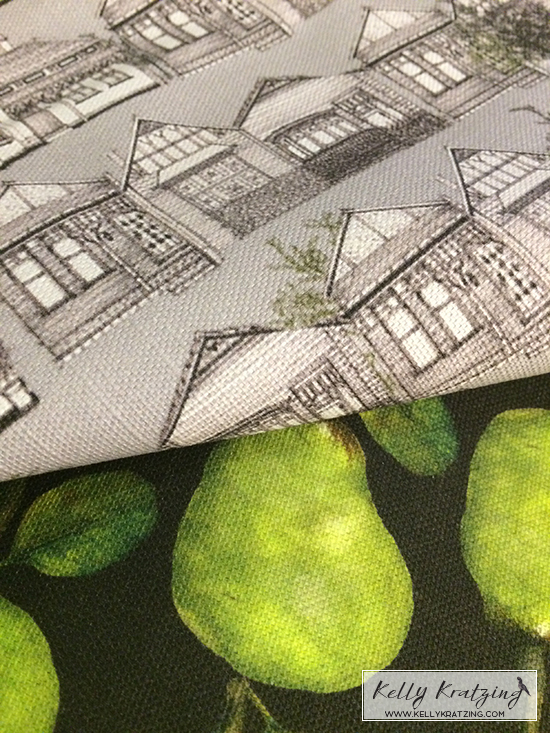 I use Next State Print for all my fabric printing and can't recommend them highly enough.